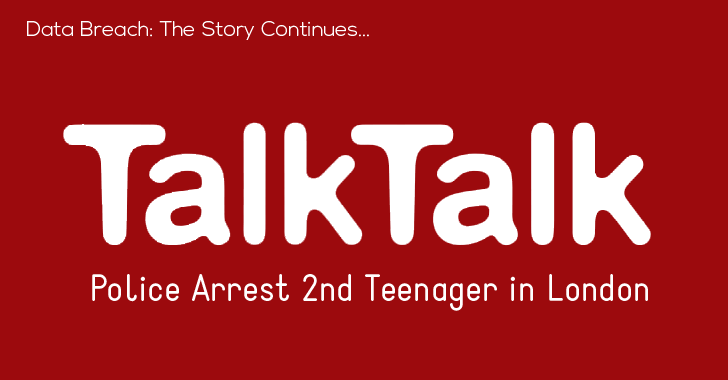 British Police have arrested a second teenage boy in relation to the major hack on the servers of UK-based telco 'TalkTalk' last week. On Monday, a 15-year-old boy (first arrest) from County Antrim, Northern Ireland, was arrested in connection with the TalkTalk Data Breach. On Thursday, The Metropolitan Police Cyber Crime Unit (MPCCU) arrested this second unnamed 16-year-old boy from Feltham in west London on suspicion of Computer Misuse Act offences. TalkTalk has confessed that “Not all of the data was encrypted”... yeah, its' too bad. However, "Investigations so far show that the information that may have been accessed is not enough on its own to take money from your bank account," the company claimed. “Starting today, we are writing to all customers who have been affected by this to let them know what information has been accessed.”, TalkTalk said in a statement. As advised earlier, the affected TalkTalk customers are highly recommended to change their passwords as soon as possible and keep an eye on their bank accounts over the next few months.